He didn’t ridicule the theory or mock those who believe it. Rather, he carefully explained the reasons for his doubts that our activities are responsible. These are reasonable questions—many echo them when their curiosity turns to climate change, because to examine what is said about it is to discover uncertainties and inconsistencies. If it is truly necessary to fight climate change these uncertainties absolutely must be addressed. Dr Greg Bodeker is an adjunct professor at the NZ Climate Change Research Institute, Victoria University of Wellington. In commenting on Dr Edmeades’ article he presented evidence in support of the climatic threat to the earth. He tried to persuade us to take action against climate change. But he ignored the questions Dr Edmeades raised and failed to explain how we cause climate change. Thus he lost the chance of winning us over. “The last six decades have been successively warmer.” But that is wrong; only three decades, 1980 to 2010, got progressively warmer. From 1950 to 1975 there was cooling, and the current decade so far is no warmer than the 2000s, except trivially by a few hundredths of a degree. “Satellites cannot measure surface air temperatures.” But that is wickedly misleading. Two world-famous teams (UAH and RSS) measure atmospheric temperatures using microwave sounding units (MSUs) that have flown on NASA satellites since 1979. The MSU detects the intensity of microwave radiation given off by atmospheric oxygen, from which the temperature of the lower troposphere is calculated. This is uncontroversial. “The trend in surface air temperature has been upwards since 1998.” But looking back through the global datasets for up to 25 years or more, the trend is flat. He might say 14 of the 15 warmest years ever recorded have occurred since 2000, but ask him “how much warmer were they?” and he will reply “a few hundredths of a degree,” which does not impress anybody. The truth is that nobody aged less than about 20 to 25 has experienced man-made global warming. “Arctic sea-ice is retreating. Since 1979 [when satellite measurements began], Arctic summertime sea-ice cover has decreased by 9-14 per cent per decade”. But he doesn’t mention that there’s robust evidence that the slow decline over just 30 years is natural. In any case, most of the reduction dates from a sudden precipitous decline only eight years ago, caused by strong winds and currents. Certainly there was less ice at times in the early 20th century. Since the record low of 2007, the ice has recovered; in seven of the years there were hundreds of thousands of square kilometres more sea ice; only one year had less. Anyway, none of this is evidence of warming, for the reductions in sea ice were not caused by warmer air. Antarctic sea ice continues to increase steadily. “Sea level has risen by about 19cm between 1901 and 2010.” Which is consistent with recent results from Church and White. But he gives no reason to believe this natural long-term rise is caused by human activities. “Many Arctic ecosystems have been adversely affected by changes in climate.” Which means warming, of course. He doesn’t specify the adverse effects, but it’s strange that while a little extra warmth arising from a little extra atmospheric CO2 apparently causes some unidentified adversity, those same levels of CO2 are causing a large increase in the growth of northern plants—which most people would consider a flourishing, not an adverse effect. “Long-term reductions in glacier volumes have been observed almost worldwide.” But glacial advance is sensitive to precipitation and topography, so observed reductions may not have been caused by atmospheric warming. Indeed, for the last 20 years there has been no atmospheric warming anyway. Recent ski seasons in New Zealand and elsewhere have begun early and been blessed with plenty of snow. Record low winter temperatures in recent years have wreaked havoc with crops and roads and killed people and livestock around the world. “Increases in global average surface temperature since the 1950s can only be explained when increases in atmospheric greenhouse gas concentrations are accounted for.” This is an admission that non-sceptical scientists don’t know what caused the warming; they took a guess. Anyway, the observations show that global temperature cooled from 1940 to 1975. He confuses his account by saying there was a small cooling during the 1950s period of warming. “As the oceans have absorbed much of the carbon dioxide emitted into the atmosphere, they have become more acidic” … which “threatens polar marine ecosystems and coral reefs.” But recent research shows some corals have strong control over their internal pH levels. Maps of ocean acidification reveal increases occur only in small areas, mostly in the tropics with none at the poles. So far there is little or no observed damage. “Changes in climate have adversely affected yields of major crops.” It’s hard to know what he’s talking about here, for global harvests of major crops have increased over many decades and stand at record highs. “Stating that ‘CO2 is essential for life on Earth and therefore cannot be responsible for climate change’ (as Dr Edmeades alludes to) is the same as saying ‘water is essential for life on Earth and therefore cannot be responsible for drowning. '” But what Dr Edmeades actually said was CO2 “is a colourless, odourless gas and essential for life on Earth.” He was simply countering the wrong-headed idea that carbon dioxide is a filthy pollution akin to dirty industrial emissions. “Changes have been observed in many extreme weather events.” Which implies they will increase. But he must know that the IPCC report on extreme weather events (SREX 2012) reported few increases in extreme events over recent decades and did not foresee higher risks in future. Dr Bodeker argues that we must take action against climate change because we’re causing it. But we’re not causing it. If he wants us to “make an intelligent, informed decision based on the evidence,” the minimum requirement is to produce evidence. Readers will no doubt agree to shun pointless debate but we might mention it was Dr Bodeker who rendered this one pointless. His evidence is flawed and in omitting to show a human cause of climate change his argument fatally abandons reason. To describe the debate as pointless after participating in it shows impressive scorn towards his own efforts, but then to blame the pointlessness on Dr Edmeades is positively breathtaking. A well-reasoned and reasonable article. I would like to know more of why the editor declined publication. If it was a reluctance to foster debate then he has missed an opportunity to increase readership. I will try to make time to pen a letter in the next few days, for what it may be worth. I suspect that the editor does not want to depart too far from the mainstream MSM line ‘Wer”e all gunna fry!” Possible reason for being wary of sticking his neck out due to job insecurities. His stated reasons are logical but not convincing. Much better than the astoundingly stupid response by the chair of the Sierra club to anti-AGW evidence presented in the US Lower House. She is interested in the coastal hazards issue in Christchurch, and we had a fairly open and frank discussion about the subject of climate change, amongst other things. I can’t see her getting the climate angle past the gatekeepers, but I thought it was fascinating how sceptical a lot of people are, even people who associate with the rather green tinged Campbell. Not on climate change he isn’t. He has yet to wise up on the IPCC’s critical criteria – observed TOA energy balance and theoretical anthropogenic radiative forcing. The IPCC’s primary man-made climate change theory (or inferred hypothesis) is falsified by observations, rendering all the secondary issues above moot. 1. CO2 is a gas with effectively one-way properties that allows sunlight to enter the atmosphere but prevents heat from leaving. It supposedly functions like the glass in a greenhouse. 2. If atmospheric CO2 levels increase, the global temperature will increase. 3. Atmospheric levels of CO2 will increase because humans are adding more every year. The IPCC says the TOA energy imbalance “controls” surface temperature. This is irrespective of CO2. Theoretical antheo forcing is now 3 to 4 times actual energy imbalance i.e. the theory is busted. Roy Spencer recently posted on Facebook that the TOA energy imbalance is around 1W/m2 but this is theoretical as it can’t be measured. This is all irrelevant to the topic. We’re not debating the science here – that’s done and dusted. The issue is about whether Paris will endorse enough mitigation to prevent 2 degrees or more. Really interested in the geopolitics of that now the US and China look to be taking the lead. Obvious question is where does that leave NZ with its pathetic 2030 target? What consequences might flow. Any comments on the science will be deleted from here on – there are plenty of dark little corners for deniers to have their discussions in. Sounds like Spencer has it in the same ballpark. Richard C’s key point is that the TOA imbalance is less than the theoretical forcing, and trendless. Now I see where you’re coming from. No. The earth’s energy balance at TOA is the difference between the entire incoming solar SW spectrum (UV-A/B, Vis, IR-A/B) and the outgoing long-wave infrared (IR-C). Outgoing is measured by orbiting satellite but I’m not sure how incoming solar is arrived at. The solar constant is probably used but I would have to look this up as to what method exactly is the measurement. Solar would not be measured by orbiting satellite obviously so maybe geo-stationary satellite(s). Stephens et al (2012) would tell us in Data or Methods I think (see paper linked below). 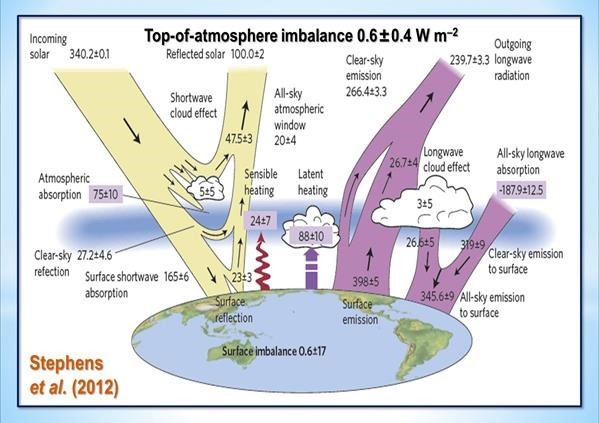 Short answer is that outgoing IR-C is actually from top of troposphere but the IPCC explicitly states (see below) that the balance is “measured at top of atmosphere”, which is where the satellites orbit. 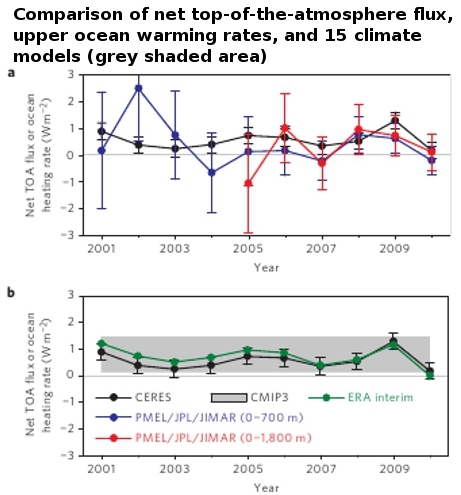 Yes, 0.6 W.m-2 as per IPCC AR5 Chapter 2 Observations: Atmosphere which cites both Loeb et al (2012) and Stephens et al (2012), both of which return this figure. Stephens et al paper linked below. It is anthropogenic forcing that is theoretical, whether total net or the constituent parts e.g. CO2. Yes. 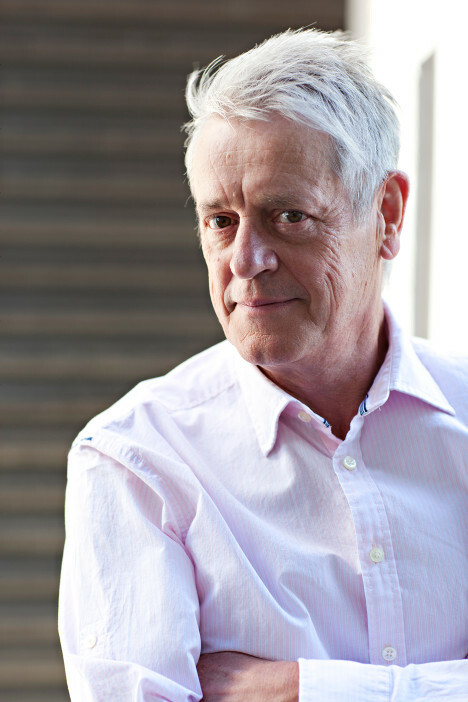 Christopher Monckton is the only prominent sceptic that I know of to actually identify the primary critical discrepancy between earth’s energy balance (0.6 W.m-2) and net theoretical anthro forcing (2.3+ W.m-2) which falsifies man-made climate change theory. But even he didn’t realize what he was on to. He embedded it in a temperature update (secondary issue) and without any heading. The link to his WUWT post is in a previous comment thread somewhere if you want me to dig it out (Hot Topic runs and hides I think). dF = 5.35 ln (C/C0) is the IPCC’s simplified theoretical CO2 forcing expression which can be used to ESTIMATE the theoretical forcing. The final form of the expression, after some tweaking, comes from the Myhre et al paper I think. In other words, sure, there’s an IR-C radiative flux downwards (DLR) of which CO2 is a minor component that can be isolated and there is a small change in that component. But the net energy flux is upwards from the surface (OLR+sensible+latent) then OLR from troposphere to space. The change in downwelling CO2 flux is having no effect whatsoever on either the TOA energy in-out budget or the surface in-out energy budget, both are 0.6 W.m-2 trendless (Stephens et al 2012). Secondly, the estimate using the expression will give about 0.3 W.m-2 over the decade 2000 – 2010 (I think) whereas Berkeley Labs found 0.2 W.m-2 over the 2000 – 2010 decade. If CO2 forcing were a valid concept, this should be the per decade trend in the current TOA energy imbalance but no such trend is evident. The IPCC concedes this in AR5 Chapter 2. The energy accumulating in the climate system (0.6 W.m-2) is obviously a solar-ocean forcing at the surface which is lagged in the ocean by decades (TOA energy balance is instantaneous speed-of-light). There can be no further forcing between surface and TOA because the surface imbalance is 0.6 and TOA imbalance is 0.6 (CO2 1.9 W.m-2 theoretical is impossible to fit between surface and TOA). Once the solar recession really kicks in post 2020, the energy accumulation in the ocean (atmosphere is merely a transfer medium) must unwind but the same oceanic lag delays the process. Whether the TOA balance actually follows the IPCC’s reasoning remains to be seen (I’m not convinced it would necessarily change from +0.6 to -0.6 say). I am totally unsurprised that Gareth Morgan dismisses the science (of AGW) as ‘done and dusted’ as the same gentleman is a self-confessed expert on everything and absolutely uncaring of offending any person whatsoever. As he is a living personification of hubris, I am waiting (without holding my breath) for his explanation of the current hiatus in warming. And I do know that cold is far worse for warm-blooded animals than a slight rise in warmth. This must be some special kind of New Maths. Warmists claim gravity cannot be the cause of any so-called “greenhouse effect” (or the “gravito-thermal greenhouse effect”) on Earth, Jupiter, nor any other planet, yet overwhelming observational evidence for every planet in our solar system (with adequate observational data – 8 planets at this point) clearly demonstrates that surface and atmospheric temperatures are a sole function of gravity/mass/pressure and independent of greenhouse gas concentrations. The IPCC claims the earth’s radiation imbalance “controls” surface temperature, and, in fact, it is their sole climate change criteria. Their theory that CO2 is an agent of climate change is falsified by their own criteria, and temperature is totally independent of that criteria anyway. Warmists claim that the current warm period is not explainable on the basis of solar activity nor astronomical variables, but this paper and many others suggest otherwise, that the current warming period is entirely explainable as a result of natural variability, and for which anthropogenic CO2 plays little to no role. Abstract. The existence of a ~ 1470 year cycle of abrupt climate change is well-established, manifesting in Bond ice-rafting debris (IRD) events, Dansgaard–Oeschger atmospheric temperature cycle, and cyclical climatic conditions precursory to increased El Niño/Southern Oscillation (ENSO) variability and intensity. This cycle is central to questions on Holocene climate stability and hence anthropogenic impacts on climate (deMenocal et al., 2000). To date no causal mechanism has been identified, although solar forcing has been previously suggested. Here we show that interacting combination of astronomical variables related to Earth’s orbit may be causally related to this cycle and several associated key isotopic spectral signals. The ~ 1470 year climate cycle may thus be regarded as a high frequency extension of the Milankovitch precessional cycle, incorporating orbital, solar and lunar forcing through interaction with the tropical and anomalistic years and Earth’s rotation.